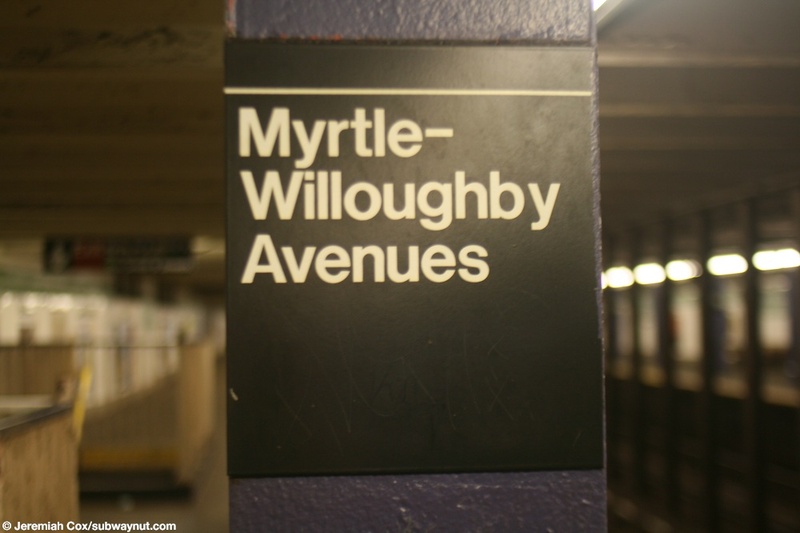 Myrtle-Willoughby Avenues is a G train station with a double name that only currently needs one, Myrtle Avenue, because the other namesakes exit has been abandoned. 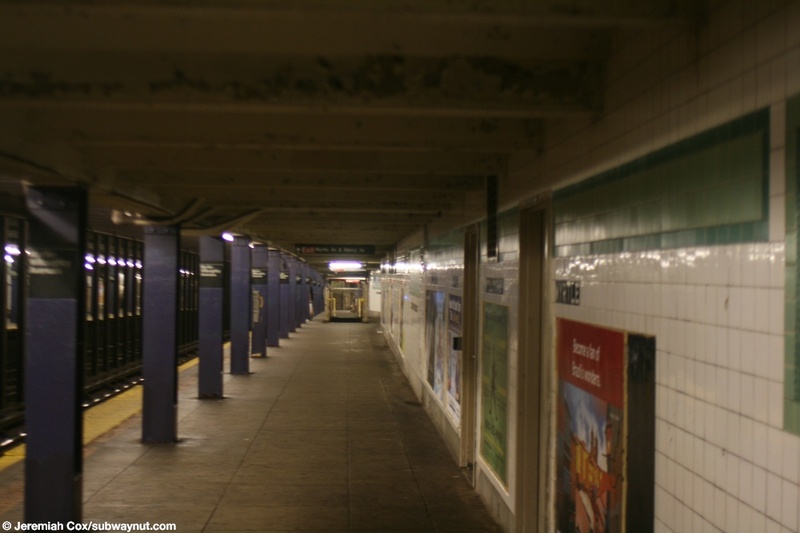 The station has a simple side platform layout with to Myrtle Avenue at the very northern end of each platform. 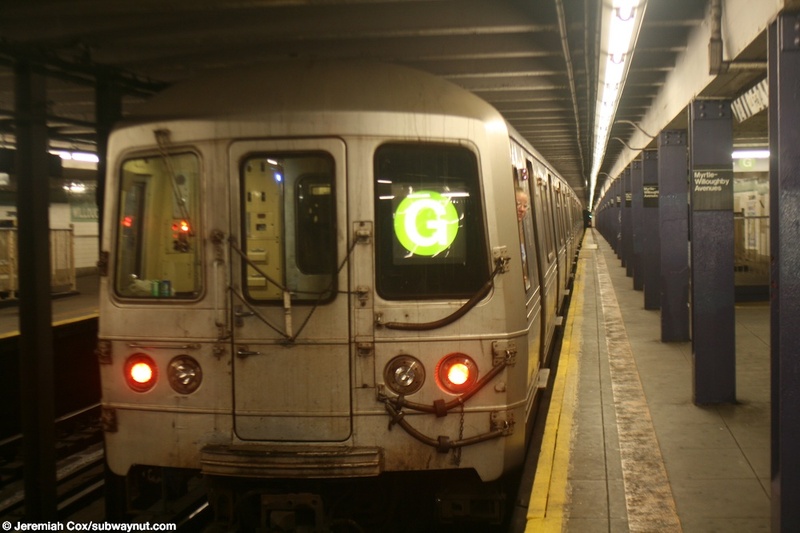 There is a transfer between directions because of an underpass that is available, this means the Queens-bound platform is now unstaffed with 2 High Entrance Gates, and a High Exit Gates. The token booth is along the Brooklyn-bound platform. 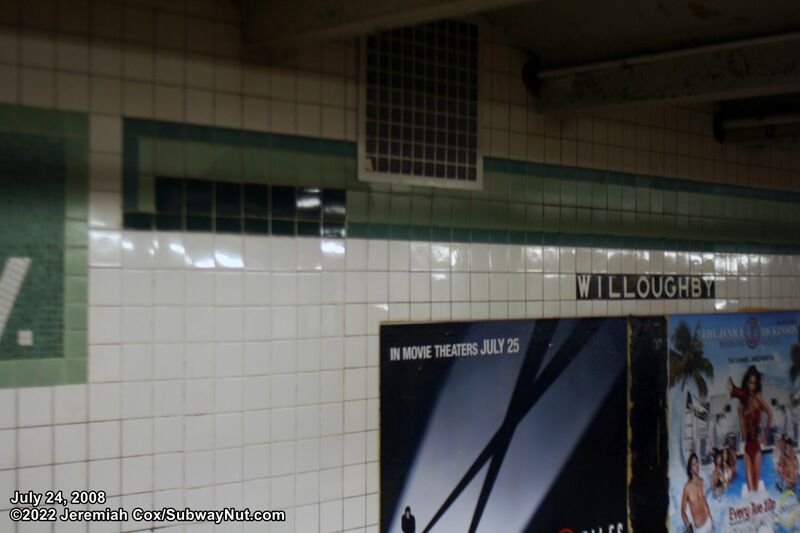 The station also has an abandoned exit to Willoughby Avenue (all the text below the name tablets are still there). 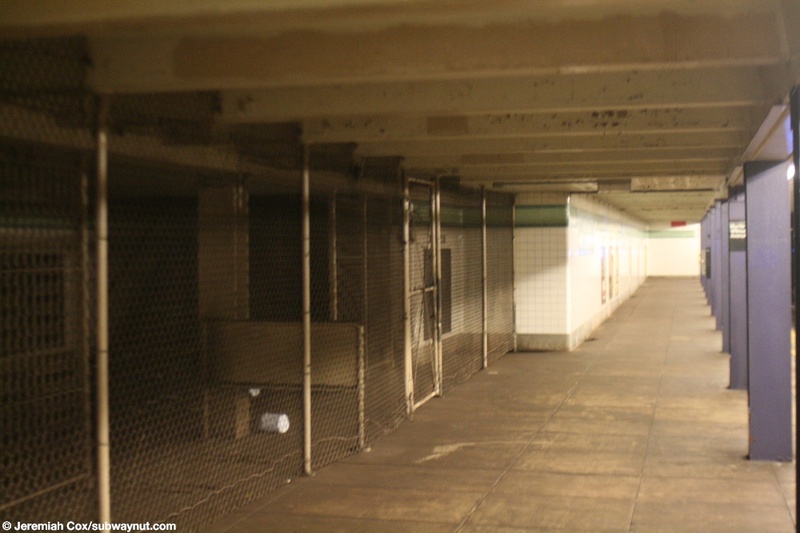 There is simply a chain link fence on each platform towards its southern end closing this exit off. 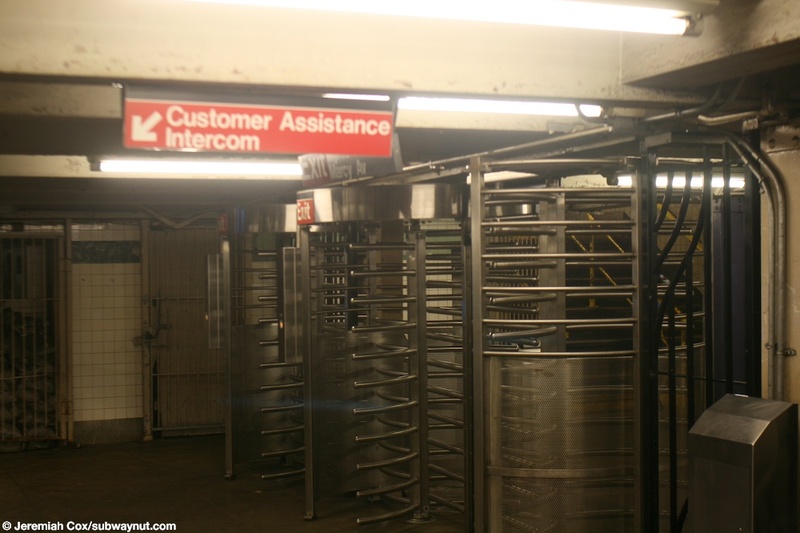 There are no more turnstiles but there is some separation fencing left. 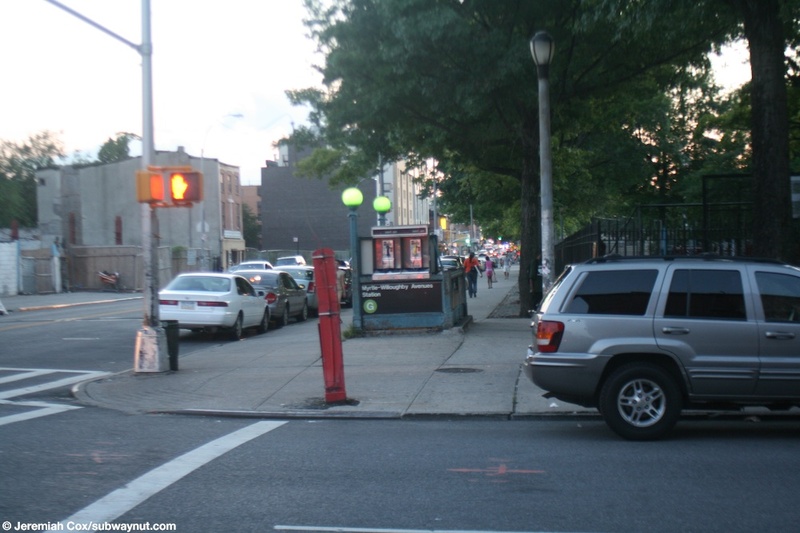 It looks like each of these exits had one staircase to the street. 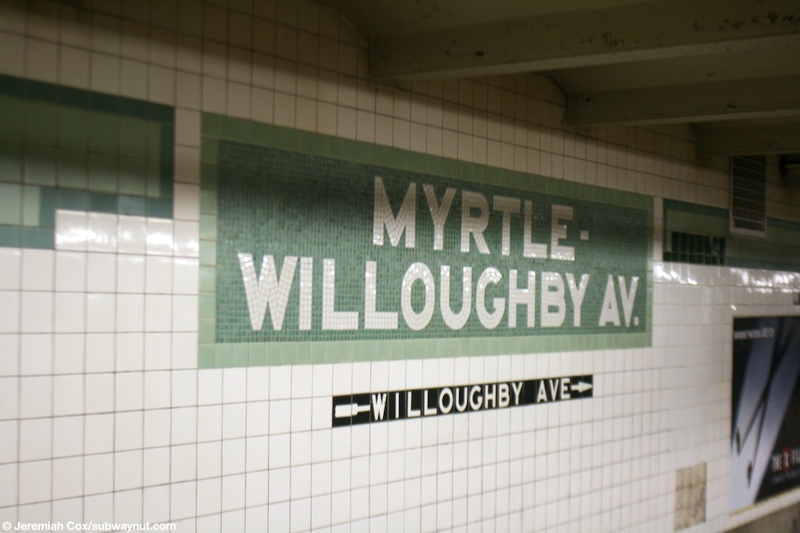 The text on the station's trim alternates between Myrtle and Willoughby. The trim itself is a light green with a darker green border. The name tablets have the light green boarder with a darker green background for the white text. 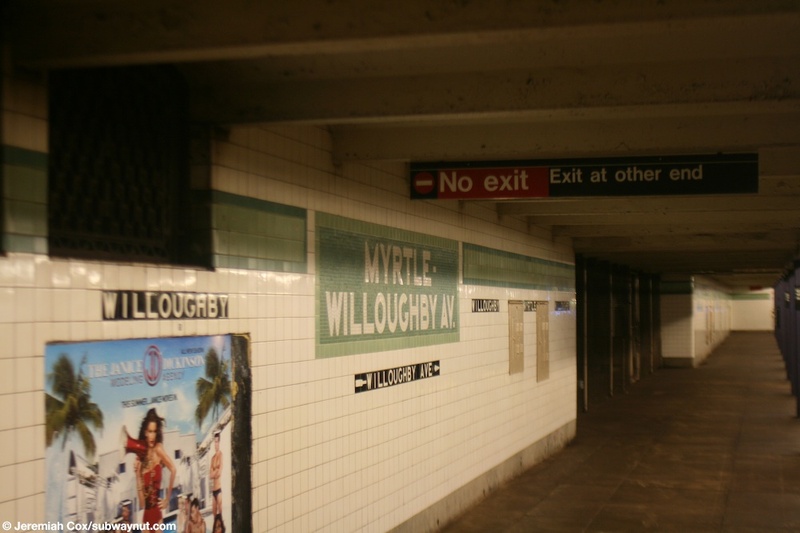 (myrtle_willoughbyg1) Looking out at Myrtle-Willoughby Avs as passengers exit a stopping G train. 14 September, 2003 (myrtle_willoughbyg2) The back of a four car Brooklyn-bound R46 G train stopped at Myrtle-Willoughby Avs. 17 August, 2008 (myrtle_willoughbyg3) Looking down the Brooklyn-bound platform at Myrtle-Willoughby Avs with two staircases down to the underpass to the Queens-bound G platform visible. 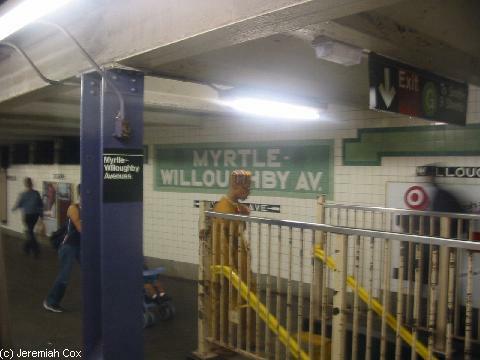 17 August, 2008 (myrtle_willoughbyg4) A large Myrtle-Willoughby Avs name tablet with text for the only open exit at Myrtle Av underneath it. 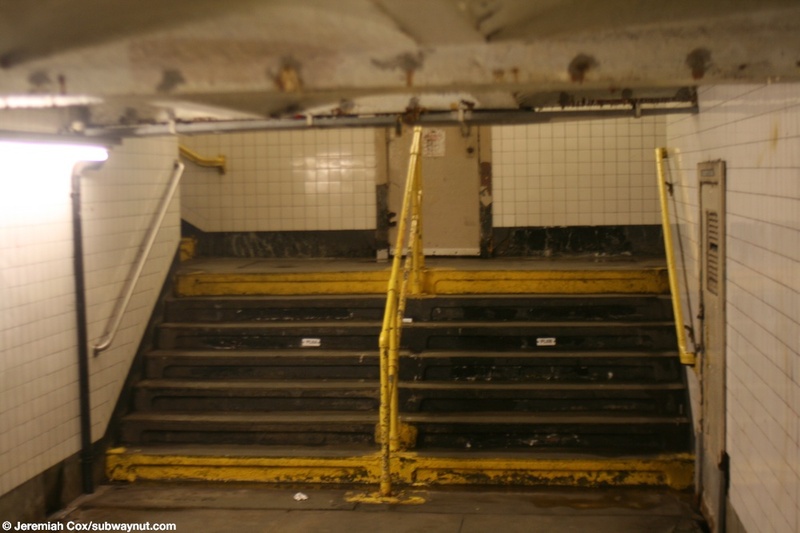 (myrtle_willoughbyg5) A staircase up to the Queens-bound platform from the underpass at Myrtle-Willoughby Avs. 17 August, 2008 (myrtle_willoughbyg6) A column sign at Myrtle-Willoughby Avs. 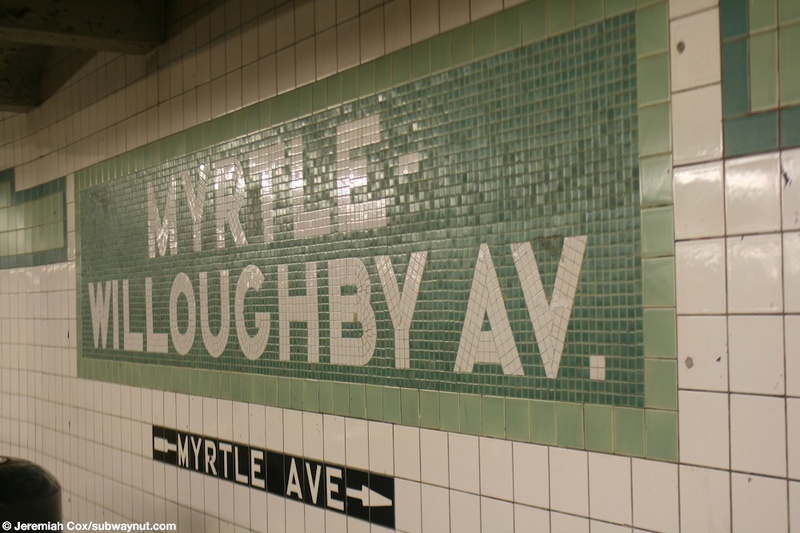 17 August, 2008 (myrtle_willoughbyg7) The station name tiling underneath the trim alternates between Myrtle and Willoughby. 17 August, 2008 (myrtle_willoughbyg8) Another name tablet at Myrtle-Willoughby Av this one has an arrow for the now closed exit to Willoughby Ave underneath it. 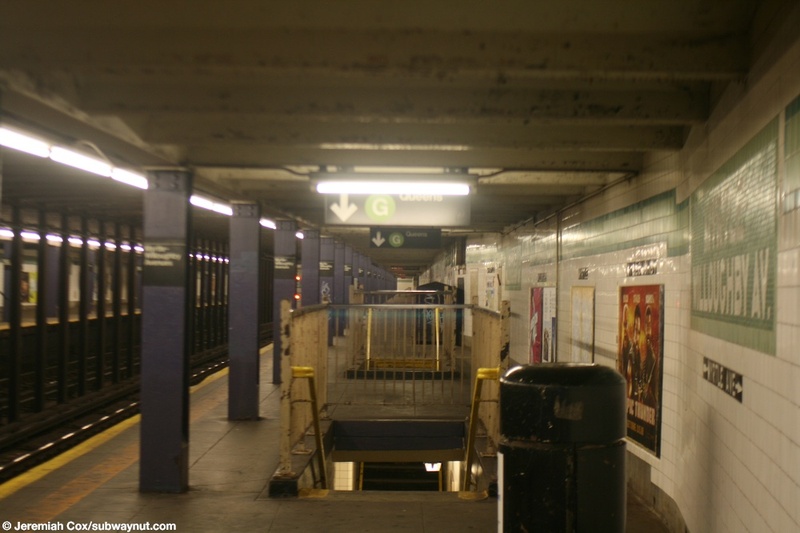 (myrtle_willoughbyg9) Another view of the Queens-bound platform walls with their generic green trim at Myrtle-Willoughby Avs. 17 August, 2008 (myrtle_willoughbyg10) Looking down the Queens-bound platform from the back of it, a portion that never sees any trains stopping at it anymore. 17 August, 2008 (myrtle_willoughbyg11) A name tablet at Myrtle-Willoughby Avs with arrow for the now closed exit to Willoughby Ave, whose now closed remains are visible. 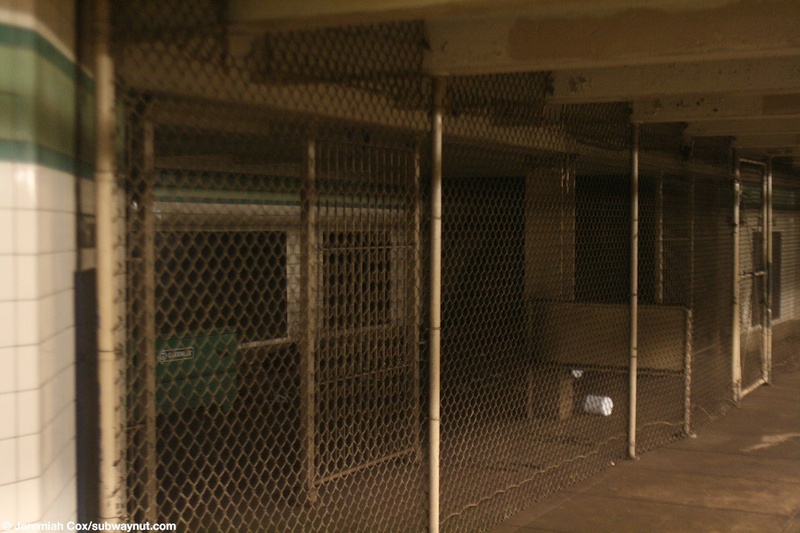 17 August, 2008 (myrtle_willoughbyg12) A chain-linked fence separates the remains of the now closed exit to Willoughby Ave on the Queens-bound platform. Some are control fencing is still intact. 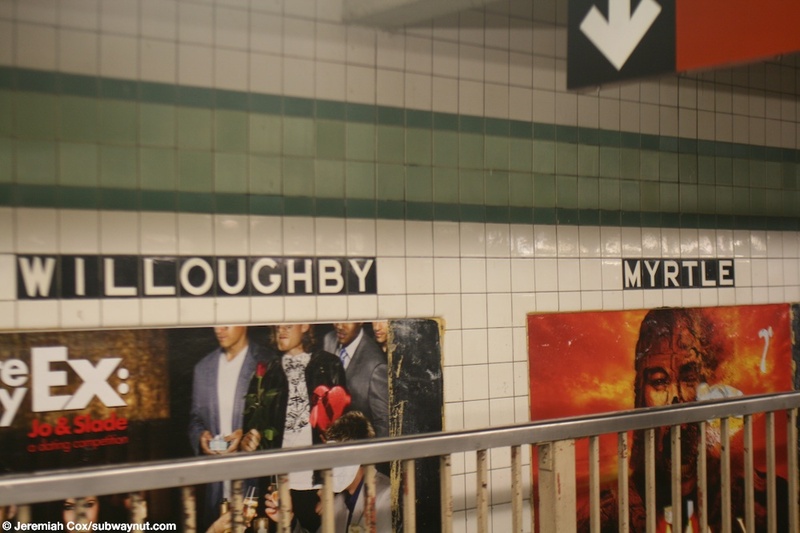 (myrtle_willoughbyg13) The exit to Willoughby Av was only towards the southern end of the platform at Myrtle-Willoughby Avs, the dark remains are a bit interesting. 17 August, 2008 (myrtle_willoughbyg14) The High Entrance and Exit turnstiles are the only way to leave the Queens-bound platform at Myrtle-Willoughby Avs without using the underpass. 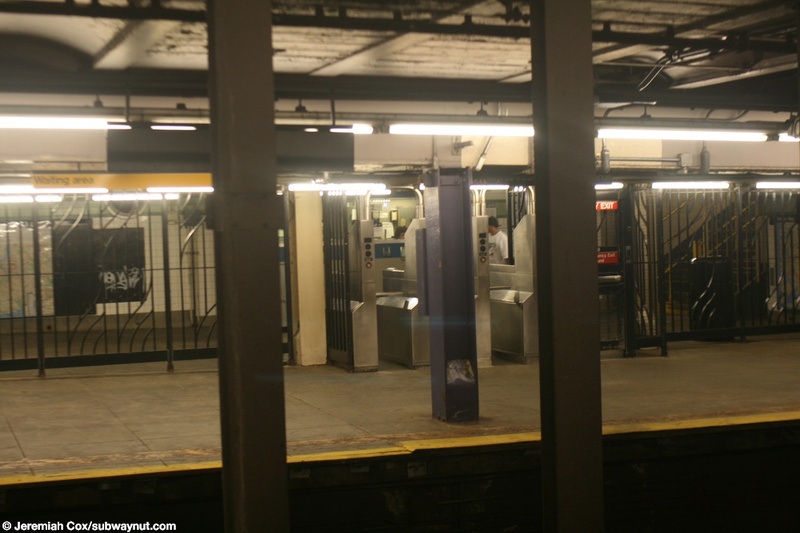 17 August, 2008 (myrtle_willoughbyg15) The Manhattan-bound platform has Myrtle-Willoughby Avs three turnstiles. 17 August, 2008 (myrtle_willoughbyg16) A Myrtle-Willoughby Avs station entrance from street level.